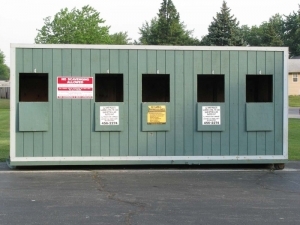 If you notice that the bins are full or materials are piled up please contact our office at 765-456-2274 so we can get the bins empties and cleaned up ASAP. If you have extra recyclables you need to dispose of you can also drop them off at 1701 N. Market Street in Kokomo - this location has 24 hour access for your convenience. What items the Drop-Off Sites accept, and how to prepare the items for recycling. Typically any paper products you can tear with your hands NOT contaminated with food. Examples include newspaper, magazines, school and office paper, envelopes, inserts, cereal boxes, and paper packaging. Flatten boxes remove all plastic liners and windows from boxes. Steel, tin and aluminum cans are acceptable. Rinse the cans. Labels and lids do not need to be removed. Tuna fish, soup, soda, alcohol cans, aluminum bottles etc. are accepted for recycling. Green, brown and clear glasses are accepted for recycling.Rinse the containers. Soda, beer, wine, jelly, mayonnaise, pickle, etc jars and bottles are accepted for recycling. No mirror, window glass, or drinking glasses, vases, ceramics, or bake ware. All number 1 through number 7 plastics are accepted at the Drop-Off locations. Numbers within the recycling symbol (Resin ID Codes) let consumers know just what the plastic is. Resin ID codes are not intended to provide guidance on the safe or appropriate use of any plastic item and should not be used for this purpose. We CANNOT accept #6 STYROFOAM grade at this time. PETE (Polyethylene Terephthalate) Includes beverage bottles (like 2-liter drink bottles). HDPE (High Density Polyethylene) Includes milk jugs, detergent bottles and bleach bottles. V (Vinyl) Includes cooking oil bottles, packaging around meats. LDPE (Low Density Polyethylene) Includes grocery store produce bags, bread bags, food wrap, and mustard squeeze bottles. PP (Polypropylene) Includes yogurt containers, shampoo bottles, syrup bottles, and margarine tubs. PS (Polystyrene) Plastic ONLY (We cannot accept the #6 Styrofoam-TM at this time) The number 6 plastics include: asprin bottles, CD cases etc. Look for the recycling symbol on the bottom or side of your plastic items. The number "7" is used to represent a group of other plastics or combinations of plastics.